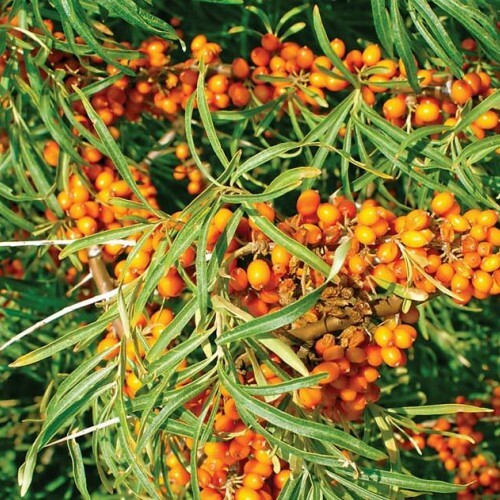 Nitrogen fixing plant used extensively for its healthy fruit containing 15 times vitamin C as oranges. Fruits also contain high levels of vitamin E, carotenoids, minerals and polyphenols. 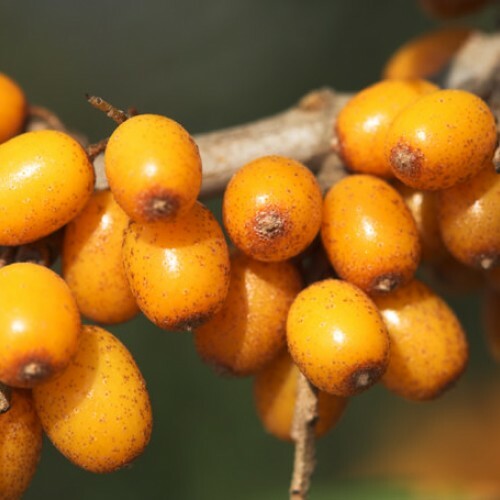 Similar to autumn olive, the small tart fruits are harvested for drinks, juices and jellies. Anyone can fruit this plant as it is adaptible to the worst conditions to grow fruit and thrives under neglect. No spray is necessary but you will need of male and female plants. The ratio in our seed grown plants is a 50-50 mix. We offer both a Chinese strain in pots as well as an improved Russian strain grown from named varieities known for their berry size and flavor. 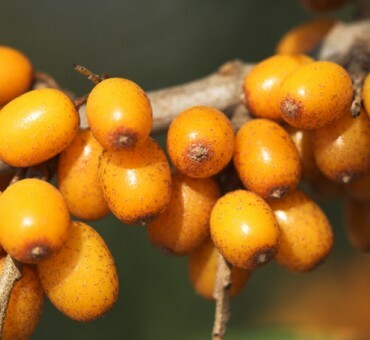 Sea-buckthorn is very similar to buffaloberry in fruiting but seaberry produces a saponin free fruit and is safe to eat. Fruits are produced on short spurs which are thorn like. Fruiting begins in 1 to 3 years from planting. . The astringent fruit is best to let fully ripe with a few frosts if possible and then processed into juice. The juice can then be mixed with sweeter juices.Best to plant in full sun with good air circulation. Male and female plants separate. Both needed for seedlings to fruit. Nitrogen fixing-any soil rock to sand ideal.Dry good. Zone 3-7. Cold climates ideal. Easy to fruit .Make sure to have at least 4 plants to insure fruiting or other clones nearby.